Acta Cryst., Section C: Structural Chemistry, (2019) C75, 433-442. Greg Powell, Pruitt Professor of Chemistry at Abilene Christian University, Abilene, Texas, visited in March, 2019. We had a great time working on crystal structures and discussing chemistry. Greg's group at Abilene is currently making large assemblies with metal-metal bonds. Left to Right: Chunhua Tony Hu, Victor Young, Nancy Ross, Joel Bernstein, Elizabeth Hillard, Larry Falvello, Lana Hiscock, Milagros Tomás, Wayne Pearson and Juergen Eckert. Photo curtesy of Alberto Albinati. on Pages 51 - 52 there is a report on the session "Crystallography in Synergy with Computation, Sectroscopy and Synthesis," which was organized by Alberto Albinati and Larry Falvello and presented at the ACA annual meeting in July. IN ADDITION to a very intersting talk by Milagros Tomás (3rd from the right), we had the pleasure of hosting an invited lecture by Joel Bernstein (4th from left), who gave a fascinating history of molecular crystal chemistry, interwoven with his own experiences as a leading researcher in this field. Joel's recent passing is sadly lamented. He leaves behind contributions of inestimable importance to chemical crystallography. Crystalline Transformers -- download an open reprint here. See Zeineb's paper in J. Mol. Struct. (2019) 1176, 165-180. 29 November, 2018. And another good-bye after a research stay. 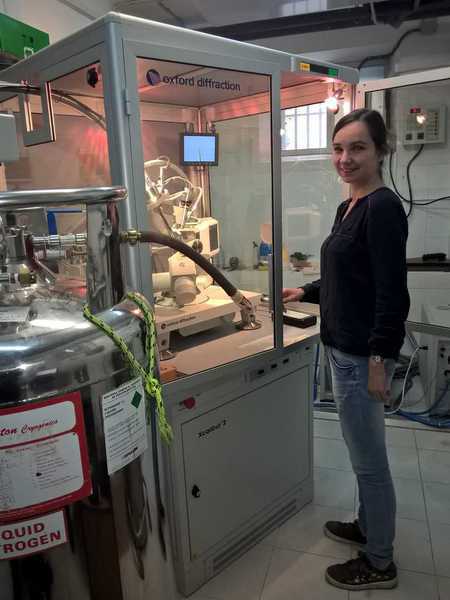 Manel is finishing her three-month research internship. Here are Manel and Irene. 26 June, 2018. Oumaima is leaving after a productive three-month stay in Zaragoza. Anna's oral presentation at "Progress in Inorganic Chemistry" (PANCH2018) in Levoča. Transition-metal hydroxy clusters with a heretofore unobserved core geometry have been synthesized by combining platinum centers with two different oxidation states and their corresponding different coordination indices and geometries. On-line in Chem. Comm. -- See two new organometallic compounds with brand-new transition-metal hydroxide core geometry. This unexpected result shows that there is still new chemistry to be discovered in this long-studied family of compounds. Chem. Commun., 2017, 53, 13121-13124. We had a visit in November from Professor Juraj Černák, who presented a seminar on cyanido chemistry. Here are some of the photos from Juraj's talk and from a visit to the diffraction lab, where Anna gave us a tour. As summer draws to a close and the new academic year begins, Alejandro (Spain), Zeineb (Tunisia) and Anna (Slovakia) gather to contemplate a classic diffractometer. En los últimos días de verano y a los albores del nuevo año académico, Alejandro (España), Zeineb (Túnez) y Anna (Eslovaquia) se juntan, contemplando un difractómetro clásico. Full article (open access) here. "A symmetric, triply interlaced 3-D anionic MOF that exhibits both magnetic order and SMM behaviour"
This article is featured on the inside back cover of this special issue of Dalton Trans. See the article. We are researchers in structural inorganic chemistry. We work in an academic environment, at the University of Zaragoza and within the Department of Inorganic Chemistry, the Aragón Materials Science Institute (ICMA) and the Institute of Chemical Synthesis and Homogeneous Catalysis (ISQCH). In the research grouping of the Autonomous Region of Aragón, we are members of the confederated group M4, Multifunctional Molecular Magnetic Materials . See us on Facebook ( Lab Larry Falvello ) and at Facebook-Pages. Excellent compendium by Phil Jeffrey, of literature references to background theory and crystallographic practice. This list is directed to macromolecular crystallographers, but is useful in any context. Training videos by Joe Reibenspies: http://xray.tamu.edu/courses.php [for single-crystal (Apex2) and powder (D8) diffractometers]. Also see Joe's Tools of the Trade list. On the significance of C---H...pi interactions. Halogen atoms as hydrogen-bond acceptors. Somos investigadores en la química inorgánica estructural. Trabajamos en el entorno académico, en la Universidad de Zaragoza, en el Instituto de Ciencia de Materiales de Aragón (ICMA) y en el Instituto de Síntesis Química y Catálisis Homogenea (ISQCH). Somos miembros del Grupo Consolidado M4, Materiales Magnéticos Moleculares Multifuncionales . Puedes ver el artículo de Milagros sobre el Arte Mudéjar y la Estructura Cristalina. CONGRATULATIONS! 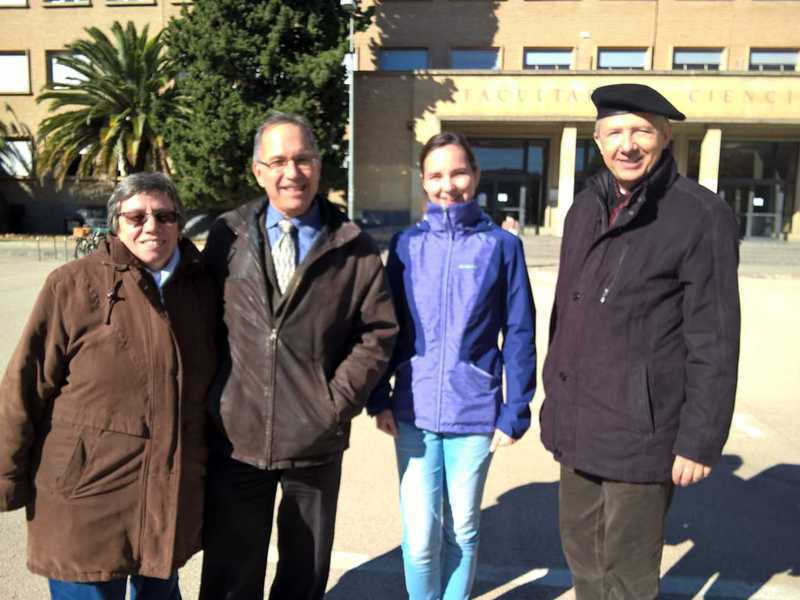 The University of Zaragoza has awarded Elena its "Premio Extraordinario de Doctorado" (University Doctorate Award with Special Distinction) for her doctoral thesis Metal Citrate Cubanes: Synthesis, Characterization and Properties. Read all about Elena's work in the university press release (Spanish). There is more about Elena's work at Aragón Investiga. Alejandro esta trabajando en el laboratorio. Elena received her Ph.D. in Zaragoza on 13 May, 2016. Elena's doctoral thesis received the "Premio Extraordinatio de Doctorado" from the University of Zaragoza. Published in European Journal of Inorganic Chemistry: New preparation, first structure analysis and magnetism of the long-known nickel benzoate trihydrate: A linear Ni∙∙∙Ni∙∙∙Ni polymer and its parallels to the active site of urease, by Anna Vráblová, Larry R. Falvello, Javier Campo, Jozef Miklovič, Roman Boča, Juraj Černák and Milagros Tomás. We welcome Professor Juraj Cernák of Pavol Jozef Safárik University in Kosice, who is here for an Erasmus visit. Under the auspices of our Erasmus program, two students from the University of Zaragoza are presently studying at UPJS. The web site for SCTE2016 is now open. The 20th International Conference on Solid Compounds of Transition Elements will be held in Zaragoza in April, 2016. All the information is on the web site. A cover graphic based on an article in Chemistry -- A European Journal, about a compound described in Elena's thesis, was used for the quiz question in the May 18, 2015, issue of Chemistry Views magazine. The quiz contest was held to mark the 20th anniversary of Chemistry -- A European Journal. The article from Chemistry -- A European Journal is here. It will be available under Open Access until the end of 2015. Photo: June 29, 2016. Anna has returned to Kosice to continue her co-tutored studies there, following a very productive three-month stay in Zaragoza. DR. SEBASTIÁN A. SUÁREZ of the University of Buenos Aires and the CONICET is here as part of his post-doctoral work. Seba is analyzing displacement parameters and programming in Fortran. WELCOME BACK! 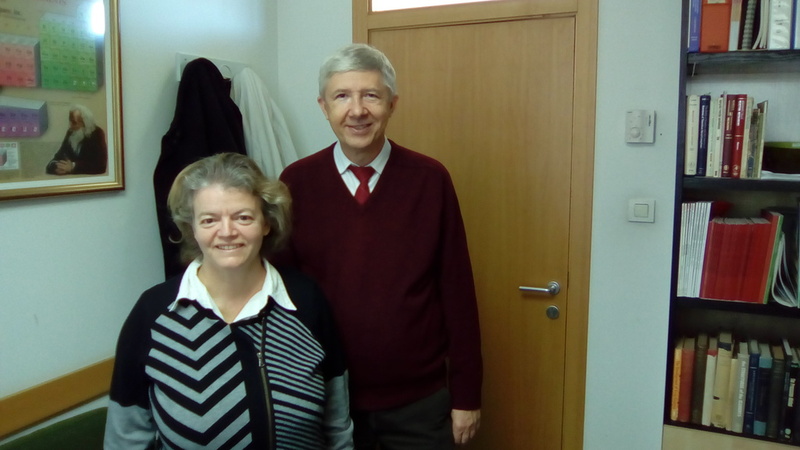 Anna Vráblová has arrived to begin a research-intensive stay in Zaragoza as part of her co-tutored Ph.D. Larry is her Co-Director in Zaragoza, and Professor Juraj Černák is Co-Director at Pavol Jozef Šafárik University in Košice. Anna was here in 2014 as a Master's student.